The link takes you to HP Magcloud where you can buy your own magazine quality copy for $11.80 (about £8.00). Printing is done in Europe and delivery times are usually no more than a week from order. Purchase also entitles you to a free digital version with optimal display. Free download of the complete issue as a .pdf. 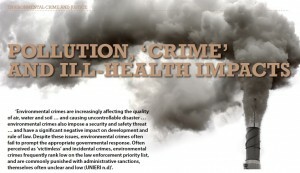 Environmental Justice: the challenge posed by environmental crime for criminal justice. 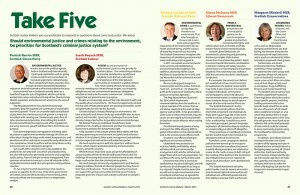 Professor Nigel South of the University of Essex has published widely on the topic of environmental crime and green criminology. Hugh Pennington is Professor Emeritus of Bacteriology, University of Aberdeen. Rob Edwards’s Sunday Herald columns and blog will be familiar to those interested in the environment. He is however, modest about what he, as a journalist, ‘knows’. Hazel Croall, theme editor and Mary Munro, managing editor of the SJM held a wide ranging conversation with him in early 2015. 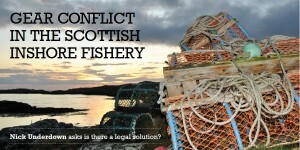 The Farmer as Environmental Criminal: a Scottish perspective. Robert Smith is Professor of Enterprise and Innovation, University of the West of Scotland, Dumfries. 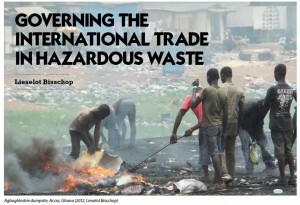 Pollution, ‘crime’ and ill-health impacts: the problems of effective control and regulation. Professor Andrew Watterston is director of the Centre for Public Health and Population Health Research professor of Health Effectiveness at the University of Stirling. Caroline Matheson is development consultant with Care Farming Scotland. Gayle Howard is SEPA’s communications officer. Gear conflict in the Scottish inshore fishery: is there a legal solution? Nick Underdown is marine policy and engagement officer for Scottish Environment LINK. The Illegal Killing of Birds of Prey in Scotland: an RSPB perspective. Ian Thomson is head of investigations, RSPB Scotland. Mary Church is head of campaigns for Friends of the Earth Scotland. Marguerite Schinkel is a research fellow at the University of Glasgow. 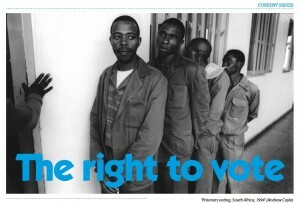 The right to vote: Albie Sachs and Andrew Coyle discuss prisoner voting rights in South Africa and their denial in the UK. In December 2014 Justice Albie Sachs, formerly of the South African Constitional Court and a key figure in the long struggle against apartheid, gave the Nelson Mandela – Oliver Tambo lecture at Strathclyde University. In questions following the lecture, Professor Andrew Coyle asked about prisoner voting rights in South Africa. This is a note of their exchange. Sarah Roberts is Families Outside’s child and family support manager. Sexual offences against children in Victorian Glasgow: the ‘abominable superstition’ and the ‘cure’ of sexually transmitted disease. Anna Forrest is a former librarian of the Royal College of Physicians and Surgeons of Glasgow. 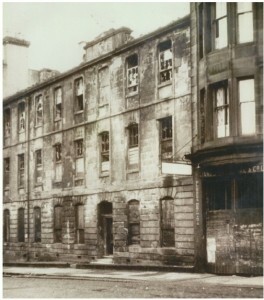 Her first article for SJM was published in our November issue: The ‘Glasgow System’: class, gender, poverty, prostitution and the policing of venereal disease in 19thc Glasgow. Lieselot Bisschop is assistant professor at John Jay College of Criminal Justice (New York, USA) and post-doctoral research affiliate of the Research Fund (FWO) at Ghent University (Belgium). Hannah Graham is a Research Fellow in Criminology at the University of Stirling, and a member of the Scottish Centre for Crime and Justice Research (SCCJR). She previously lectured in Criminology and Sociology at the University of Tasmania, Australia. Steve Graham is a Reintegration and Transition Consultant in the Department of Justice Tasmania Prison Service, Australia. 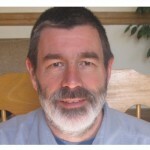 He also produces the non-profit reintegration resources website www.reintegrateinfo.com. Jonathon Field is a Manager in the Sentence Management, Support and Reintegration unit in the Department of Justice Tasmania Prison Service, Australia. Read the edited version or listen to the complete interview on Soundcloud. Responses from MSPs Patrick Harvie, Sarah Boyack, Margaret Mitchell, Alison McInnes and Richard Lochhead to our question. Kate Graham works for ASSIST, the specialist independent service focused on reducing the risk to and improving the safety of victims of domestic abuse. She is based in Glasgow Sheriff Court. 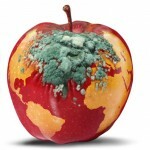 Jo Buckle of Glasgow Caledonian University reviews Brisman A and South N (2014) Green Cultural Criminology: Constructions of Environmental Harm, Consumerism, and Resistance to Ecocide. Routledge; 162pp. 9790415630740 (pbk) and South N and Brisman A (eds) (2014) Routledge International Handbook of Green Criminology. Routledge; 448pp. 9781138846692 (pbk).